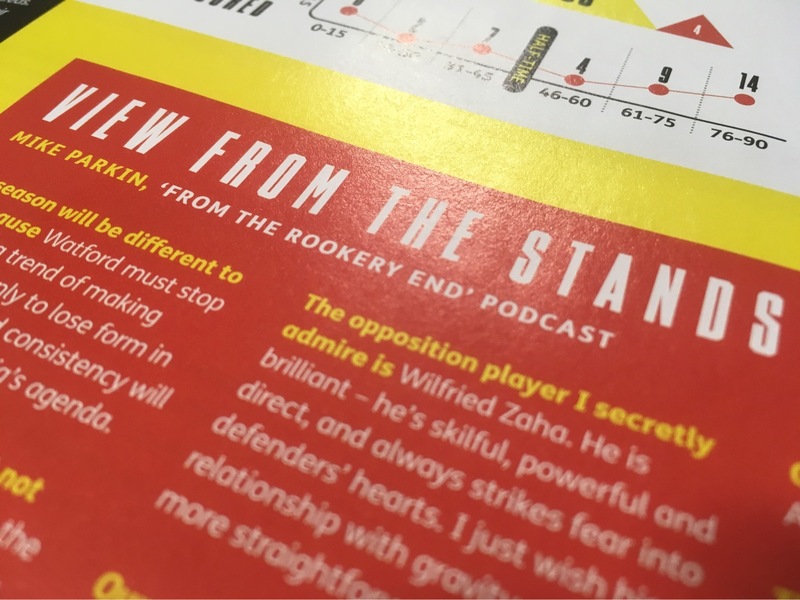 Those of you that buy Four Four Two magazine may well have noticed that two of the From the Rookery End team were mentioned. Our very own Kieran has penned an incredible piece on the WSL, while Mike answered a few questions about Watford’s upcoming season. As regular listeners to the podcast will know, Mike is never short of a word or two, so his answers were (quite rightly!) edited to save space in the magazine. We didn’t want you to miss out though, o we’ve reproduced his answers in full below. Let us know what you think of Mike’s views – you can find us on Twitter, Facebook and Instagram! It has to be! Watford’s past three seasons in the top flight have followed an alarming trend; a great start followed by a new year loss of form. That trajectory needs to change and I’ve no doubt consistency it is high on Javi Gracia’s agenda. Adrian Mariappa. There were a few raised eyebrows when he was brought back for his second stint, but in a team ravaged by injury and defensive frailty, Mariappa has always been reliable. Most will be aware of him already, but Will Hughes made a huge impression, despite suffering an injury that kept him out for a large chunk of the season. His fellow midfielder Nathanial Chalobah could also make a real name for himself if he can stay fit, too. Watford have scored just one goal away from home in 2018, so it’s hard to look forward to any matches away from Vicarage Road. Fulham is always a good day out, while Newcastle United is a brilliant trip. I’m looking forward to checking out Spurs’ new ground, but considering Watford’s history there, I’ll probably do that when the NFL are in town! I’ll give this accolade to Manchester United. Always travel in big numbers and have a brilliant array of constantly updated songs. It always feels like a big game when they are in town. I’m not the biggest fan of striker Stefano Okaka, but we’re pretty short on attacking options so I’ll give his place to Jose Holebas. A divisive character, I think we get more bad than good from the volatile left back. Wilfried Zaha. He’s brilliant. Skilful, powerful, direct and strikes fear into the heart of defenders week in week out. I just wish his relationship with gravity was a bit more straightforward. Wilfired Zaha! He’s been the player Watford players love to hate for a while now, and did himself no favours by throwing a spectacular hissy fit after a bit of gentle ribbing from match-day mascot Harry the Hornet. Gets a hotter reception than most, due in part to the damage he always seems to do against us. No more changes in the Head Coach hot-seat! It would be lovely to see the season through with the same man in charge. Saturday 11 August. For clubs like Watford a decent start is absolutely vital, so a decent display at home to Brighton on the opening day is going to be important. Vicarage Road hosts the largest sensory room in the Premier League. The specially designed facility allows kids on the autism spectrum to watch the game, with their families, in a safe and welcoming environment. 12th. Most Watford supporters will be happy if we can break the cycle of a dismal second half of the season. Pleased to see Gerard Deulofeu make his loan move permanent? He showed what he could do in his brief spell last season, contributing to a memorable home win over Chelsea. It’s now up to him as to whether he can perform over a sustained period. His last permanent stint ended in disappointment with Everton, so hopefully he’ll have a point to prove this time round. It’s hard to view this as anything other than a great signing.